Estela loves to dance, and her favorite dance is salsa. So when she sees her neighbors using salsa as an exercise workout, she gets excited. Estela’s mother wants to lose weight, and Estela recommends she join the neighbors in their exercise group. Her mother does, and Estella also attends to offer encouragement and watch her mother dance. Estela begins to dance with the exercise class, but soon, an announcement is made that children are no longer welcomed. 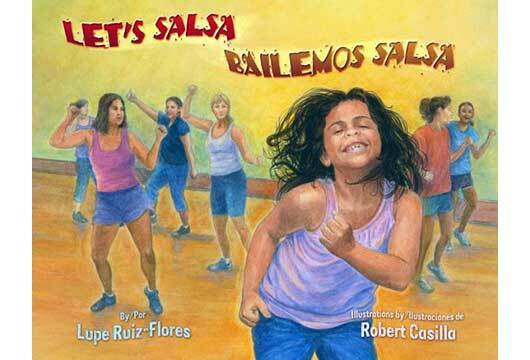 At school, Estella learns about petitioning and decides to create a petition for the salsa program to lift its ban on children. She is able to collect enough signatures for her petition, and in the process, creates a salsa exercise program just for children that also include a nutritional education component. Full-page illustrations convey movement and excitement on every page. The top-down English and Spanish text is sometimes separated by thematic artwork that further enhances the overall story. Among many others, this book includes a message to readers about how they can change not only their own lives, but also the lives of their family members, and their community at large.